Posted on January 30, 2019 at 9:55 pm. 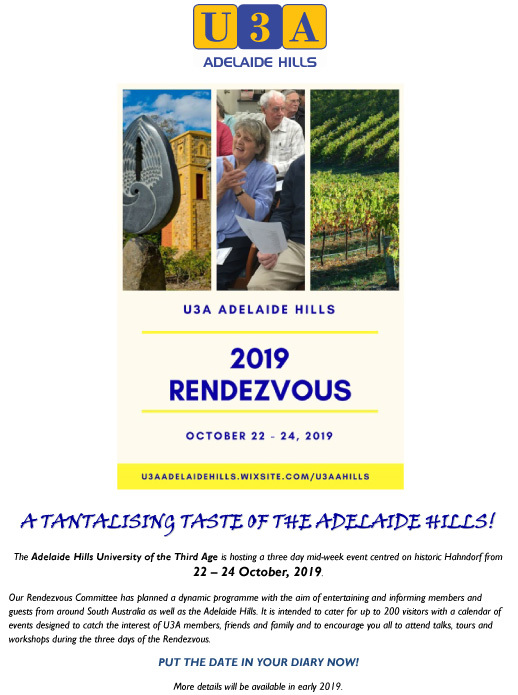 Adelaide Hills U3A are having a Rendezvous. Click the heading to view the flier. Posted on December 10, 2018 at 7:05 pm. U3A Prospect committee recently ran activities at the Prospect Council Volunteers Breakfast which included a “photo booth” ! They took a photo of themselves to send to their Treasurer currently in England. Posted on November 11, 2018 at 2:00 pm. 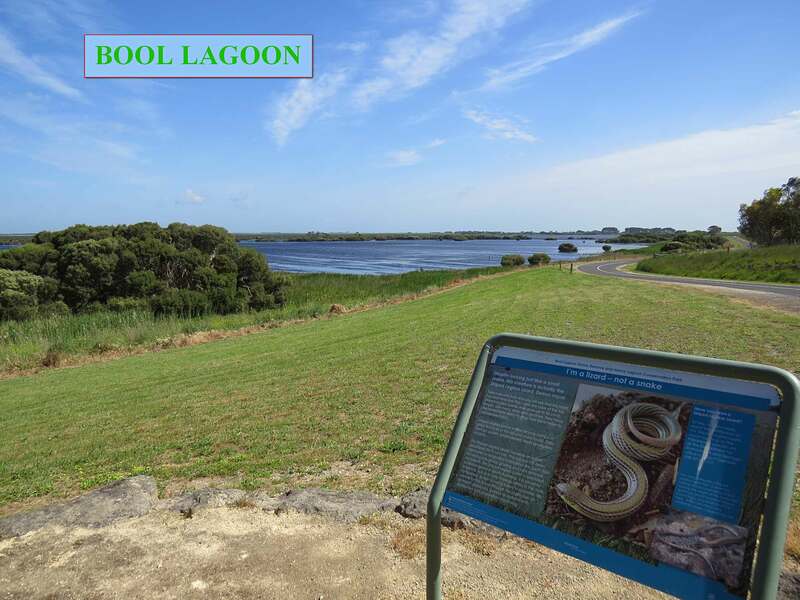 Groups of Science and Environment combined to visit Bool Lagoon, an important natural water reserve which is a conservation park and game reserve. 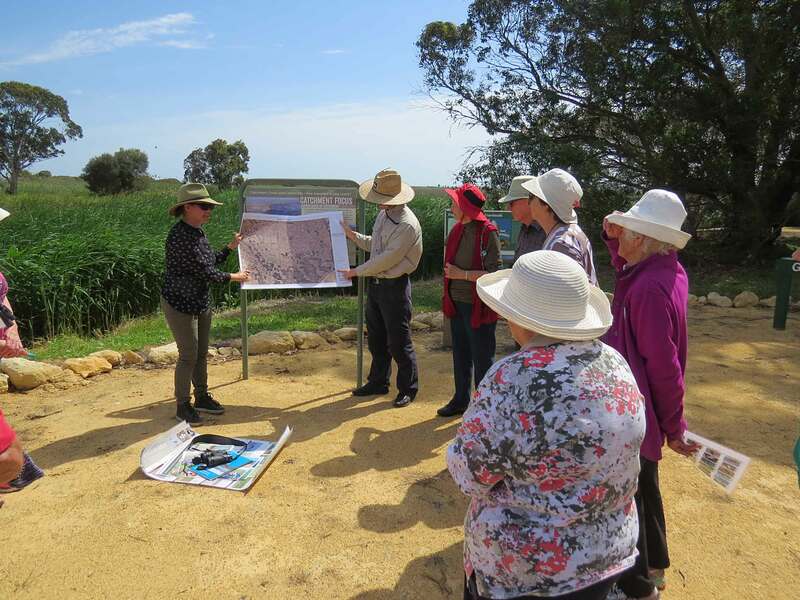 The reserve is situated 360km south east from Adelaide and is 27km south of Naracoorte. Our visit was guided by two officers from National Parks SA who explained to us the finely monitored water levels of the lagoon and details of the birds and other fauna that habituate the region and others which come from overseas for their breeding. Following this our 20 participants travelled another 10km to Bourne’s Bird Museum where we had our packed lunch and were given a tour of the museum. U3A Mt. Gambier were invited to be a part of a display of activities aimed at Seniors. 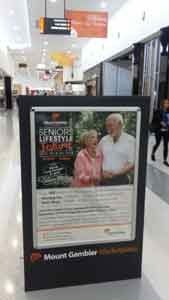 The event was held at the Woolworths Market Place Shopping Centre on the 7th/8th November. Posted on November 2, 2018 at 9:20 pm. We would like to thank Katarina Spudic for accepting the position of Treasurer for U3ASA. 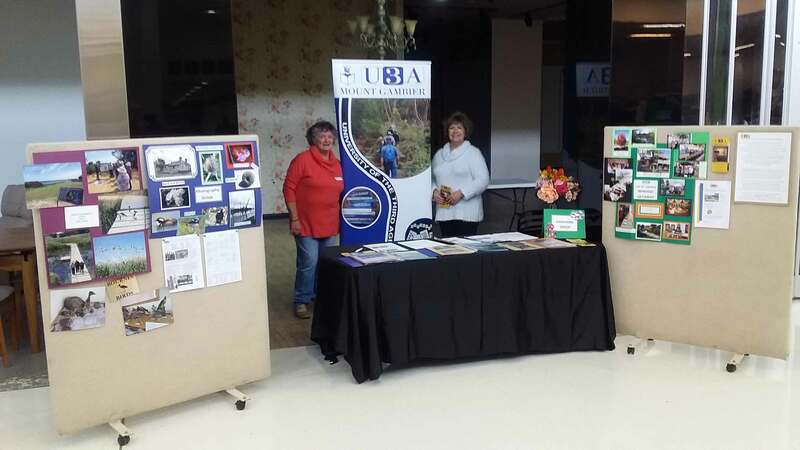 Katarina is a member of both U3A Tea Tree Gully and U3A Campbelltown. Our thanks go to Peter Adams, who was our former Treasurer and we wish him well for the future. Go to About Us to view Katarina’s profile. Posted on July 18, 2018 at 6:12 pm. The report for our final year of funding, showing how the funds were used, has been delivered to the Department of Industry and Skills.  This may be accessed in this website by going to Resources > Grants. Creativity Australia is giving you the opportunity to start your own Community Choir. Posted on July 4, 2018 at 7:13 pm. Creativity Australia (https://www.creativityaustralia.org.au/) is giving individuals the opportunity to start their own Community Choir! Creativity Australia is building a happier, healthier, more inclusive nation, through the neuro-scientific benefits of community singing and the With One Voice Choirs. To make it easier for communities to start their own choir, Creativity Australia is offering a limited number of start-up funding grants of up to $10,000. Successful applicants will receive the start-up grant and join a 12-month intensive mentoring programme to guide them through the process of building their own ‘With One Voice Social Franchise’ choir. 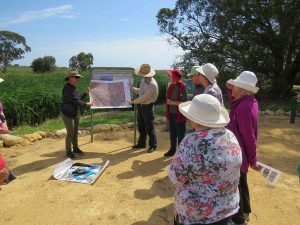 With One Voice Social Franchise programs are set up and ran by local volunteers using the resources and materials provided by Creativity Australia. By establishing a local community choir under the auspices of Creativity Australia (as a registered charity) you hold a licence that enables the choir to raise funds to support projects and initiatives at a local level. The choir is set up as an unincorporated association under the umbrella of Creativity Australia. This includes an independent bank account which is jointly managed by the local choir volunteers and Creativity Australia. Posted on July 3, 2018 at 1:39 pm. We would all be aware of relatively recent investigations into nursing homes and the way in which they are run and how their residents are treated. 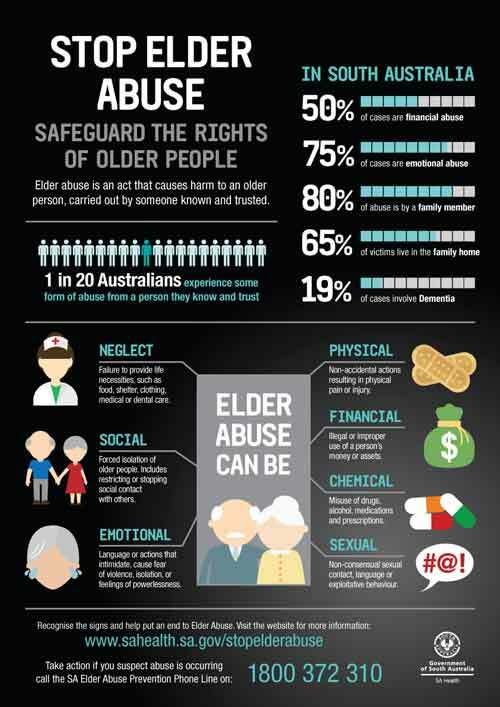 Unfortunately the abuse of some of our older citizens is not confined to nursing homes and probably more frequently occurs far closer to the victim’s own homes. The South Australian Government is running a campaign to highlight the need to report and recognise this abuse. Please use the SA Elder Abuse Prevention Phone Line 1800 372 310 for support and/or information. Remember, in a similar way to reporting Child Abuse, you do not have to have proof to contact the hotline – merely a suspicion. Posted on February 25, 2018 at 6:50 pm. U3A Prospect is ready for their classes to begin on 28th March. They have 80 enrolled members, a website and an excellent team of volunteers. 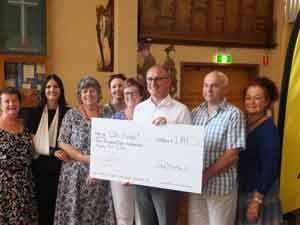 The photograph shows local Labor candidate, Jo Chapley, along with Premier Jay Weatherill, presenting the committee with a cheque to fund a TV and projector. Congratulations to Jenny Rossiter and her committee for their hard work and dedication, we all wish you great success in further promoting the great organisation we call U3A. Posted on December 8, 2017 at 5:50 pm. Check out Prospect’s Facebook page – great beginnings!